It has come to our attention speculations that Abstergo is obtaining genetic code know as DNA without consent of its owner. There has also been talk that we are building a secret DNA library without public notification or consent. This is all false information; we at Abstergo adhere to strict rules and only obtain DNA or any other genetic information through extensive contracts that are signed willing by our generous volunteers. Depending on our work and the contract signed by our volunteer, we dispose of any genetic information obtained during testing once we are finished. We thank you for your patients while we sort this out, for more information please call our public relations desk. Thanks to our engineers’ work with Project Legacy and the DDS, Abstergo is about ready to venture into a new area of simulation with the Animus. After almost 20 years of studying users in the Animus and compiling DNA memory, there is enough information to start forming simulations of alternative history. Alternative history or “Uchronia” refers to a work of fiction regarding the timeline of our world if an important historical event had occurred or ended differently. Perhaps it is better explained in an example. Within the first months of 2013, Abstergo will be releasing an add-on program for the Animus that will allow the user to live in a time when checks and balances fail in the newly formed United States of America. Instead of adopting a democratic presidency, George Washington names himself King of the newborn nation and imposes a tyrannical, power-drunk rule. The Tyranny of King Washington will be the first of what we hope will be a series of add-ons with more to follow. Just another way for you to Enjoy Your Animus! 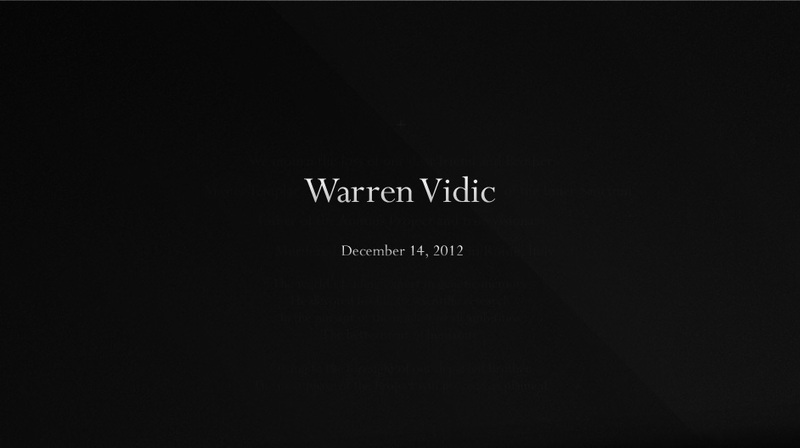 It is with great sadness that Abstergo announces the death of one of its most influential employees, Dr. Warren Vidic. Dr. Vidic’s body was found in his office at our facility in Rome early this morning. Cause of death is under investigation, pending an autopsy by officials. Dr. Vidic has been with Abstergo for the past 35 years and has been a key player in many of Abstergo’s advancements in biotechnology. Dr. Vidic was the head of the department that spearheaded the entire Animus project, which is quite possibly Abstergo’s most famous product. Though he is gone, his legacy will live on with the various Animus projects he helped develop. We will keep you updated with funeral information. We thank you for your continued support during this sad time. We’ve been thrilled by all the results we’ve had since the launch, and we already released one of our developer’s diaries. Unfortunately, it would seem that a group of hackers has shared some false information on it. It’s unfortunate, but we assure you none of it is true, and our security team is doing it’s best to assure the best educational courses and historical games on our quality Disks, while maintaining safety.